I liked the nastiness in this book. Does that make me a bad person? Side Effects May Vary represented teenagers’ immaturity well enough. This book hit my opinion of ‘believable’ right in the nose. Alice is not a good person on a good day, but I liked how her character is portrayed. I can easily imagine her as a real person. She wants to come out on top of everything, always. She has to have the last word. She has to show everyone that she won, even when the victory cost her a part of herself. You know how people say if you hate a person, you hate something in him/her that’s part of yourself? Well, I guess I hated Alice’s attitude because it’s a part of me that I hated. I think that’s why I like her character. I can relate to her somehow. I liked the angst in this book. I could almost feel every bitter, hateful word hitting me in the chest. I liked the portrayal of all the other characters, because they were all believable. I liked everyone’s interaction with each other. I wanted to cry for Alice, for her Mom, for her Dad, and even for Harvey. There were times when they all got so frustrating that I just wanted to cry in frustration, but in the end all was well. This book is not about a bucket list. It’s not about Alice’s road to recovery. It’s not about her battle with cancer. 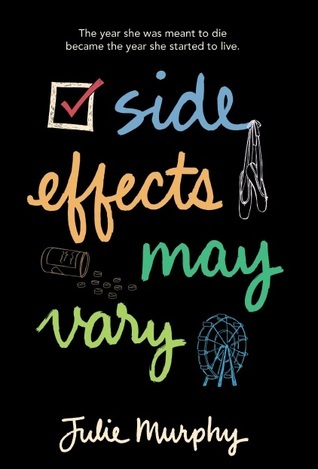 Side Effects May Vary is about acceptance and redemption.